Send a thank you message to all your relatives, friends and colleagues who made your party as special as it was. In person, by text, email or Facebook, it’s important to acknowledge the people who helped making your birthday an awesome memory. When it comes to memorable birthday parties, we most often remember the people who attended, forgetting the gifts. That’s because the people who are dear to us, be it friends or family, enrich our lives and help us mark the passage of time with fond memories. Whether you are surprised with a loud, alcohol driven bash, or plan your own intimate gathering, birthdays are a time to create fun, celebrate milestones and draw close the people who mean the most to us. When it’s all said and done, and we’re clearing out the balloons and leftover cake, we want to thank those who made the day so special. Sometimes in person, sometimes by text, email or Facebook, it’s important to acknowledge the people who made contributions to the creation of those memories. Here are a few examples to ignite your own personal expression of thanks. Tremendous party, tremendous friends and tremendous memories. Thanks for being there to share my birthday with me. You guys never cease to amaze me. You totally surprised me with the party and the friends and family who attended. I really felt the love. Family is hands-down the most important influence in my life. I was so touched to have almost my entire family there to celebrate my milestone birthday. Every birthday party has a “theme” and my birthday party’s theme was GRATITUDE. I’m so thankful to have you there to celebrate with me. 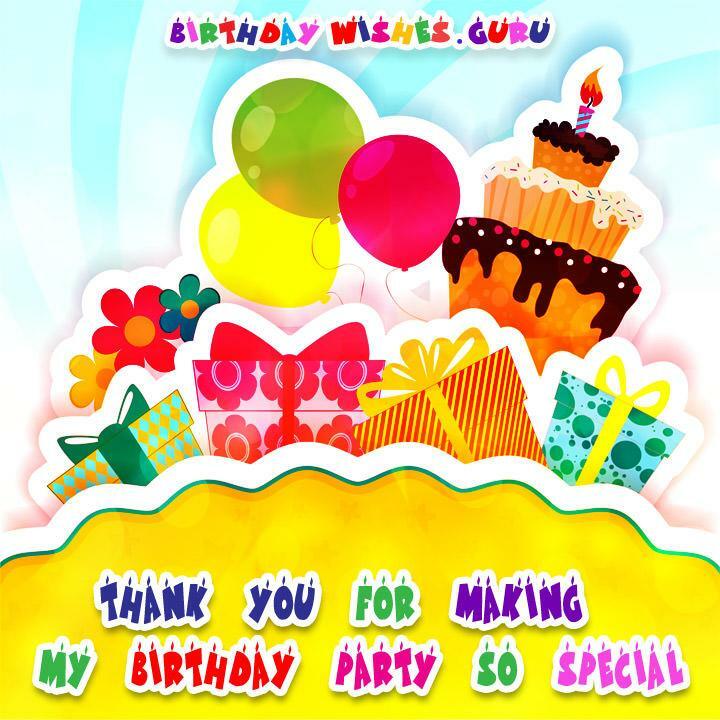 I’m sure that my party will enter the annals of birthday lore, and much of the credit goes to you. Great time! Good food, good wine, good cake, and good friends. Sounds like a complete birthday to me! Thanks so much. I don’t know whether my birthday parties actually get better every year or if I simply appreciate them (and you) more each year, but thank you so much for being there. Hey, girlfriend! Remember our birthday parties where we all wore little hats with our age on them? Apparently, with age DOES come wisdom! Hope you had a great time. I don’t need a giant, loud crowded, tricked-out birthday bash. I got exactly what I wanted this year — spending the day with you. If the severity of the hangover is a measure of the awesome intensity of the birthday party, we must have had a total blast! Thanks, friend. I feel like I am the most blessed person in the world when I think of the gathering of beautiful people at my birthday party. I couldn’t be luckier. Stupendous, ridiculous, epic, cacophonous, legendary, euphoric……running-out-of-adjectives birthday! Thanks! Smiling, telling family stories, catching up and appreciating the love our family shares — that’s the perfect birthday party. I don’t know how you do it, but every year you make my birthday party more special than the last. I appreciate you so much. Roses are red, violets are blue. I’m not a year older, and neither are you. You got my back on this, right? Thanks for being there. A generous birthday gift, like the one you gave me, deserves a “Oh, you shouldn’t have!” Instead, I’ll just say thank you for sharing my day with me. The only problem with my birthday party is how I’ll be able to top it for YOUR birthday! You made it so much fun. I realize that being at a birthday party with some of my guests made you a bit uncomfortable, but you don’t know how much it meant to me that you came anyway. When I say my prayers tonight, I’m going to thank my Heavenly Father for allowing me to be on earth this long, and for giving me such wonderful people to spend my birthday with.